Remember to look at the new pictures on the website: http://www.cancunchristianfellowship.com/ and also check out our Blog Site at http://cancunchristianfellowship.blogspot.com/ . Financial contributions are always appreciated. If you would like to make a financial contribution, please contact Tom Martin tommartin@inbox.com or Cherilyn Martin cherilynmartin@inbox.com . New mission partners, “Open Hearts” Sunday School Class in Houston took up a collection for the children’s Christmas. This represents the true spirit of Christmas and serving God by serving others. Thank you! Cancun Christian Fellowship donated and delivered Beef, Pork, Chicken, Chorizo and Cereal to our Cancun Christian orphanage Wednesday. We had several communications from Renee Loubert this week. It is always nice to hear from her and to remain thankful for the work she did while living at the orphanage. We are thankful for a children’s Christmas donation from mission partners Joe and Grace Holland of Cancun. Your faith in our mission activity is appreciated. Pastor Mancilla is at home recovering from surgery. We visited with him Sunday afternoon and the recovery process appears slow. Please keep him in your prayers. If you have a non-food donation (clothing, toys, books, games etc) please bring the item(s) and give them to Cherilyn or Laurie for sorting and distribution. It will allow us to make better use of donated items. Nina is working on a wonderful Christmas surprise for us. If I told you about it today, it would not be a surprise. TJ donated soap, vegetables and children’s clothing this week. As always TJ, your contribution is appreciated. The Mission Activity Committee met today to approve expenditures for November and a budget for December. Thanks to you and our mission partners around the world, we continue to serve God by serving others. Tonight was “Mickey Mouse Celebrates Christmas” night at Casa Hogar para Ninos Esperanza and it was FANTASTIC! 14 mission workers showed up to play Santa’s Helper for the children. Anna handled the face painting, Nancy, Cherilyn and Amy, Alia, Katherine and others worked on crafts with the children (Nancy was also spotted decorating the Christmas tree). Two young ladies from Nancy’s school were also there to help with children’s games. Harold and Henry were the wing nuts that held it all together. 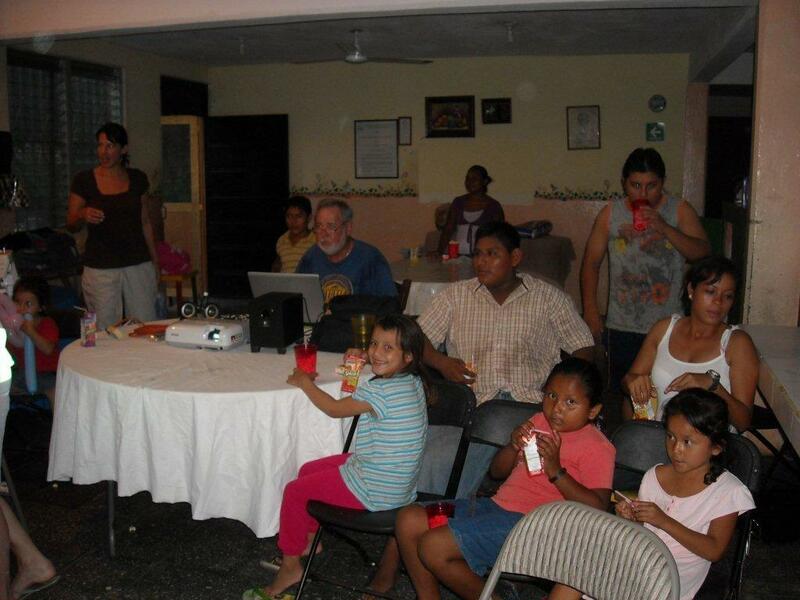 A special thanks to Playa del Carmen friends of Cancun Christian Fellowship for furnishing the entertaining movie. The ladies also served cookies, cake, popcorn and drinks. Needless to say the children were excited. A special thanks to everyone that participated. Of course, food items should always be delivered on Wednesday. If you take a food donation to the orphanage, please send us an email telling us what you donated. It will keep us from duplicating your donation and allow us to put funds in other needed food areas. If you want to make a food donation but do not have time to go to the orphanage, we will be happy to deliver your donation for you on Wednesday. A Wednesday Men’s Group is offered by Cancun Christian Fellowship. For information, please contact Tom Martin. tommartin@inbox.com or 998-121-1316. A Wednesday Ladies’ Group also meets in Cancun. For information, please contact Cherilyn Martin. cherilynmartin@inbox.com or 998-121-1315.